In this article, which serves as a foundation for the category of Science of Energy Healing in the whole website, I explain how the electric and magnetic components of the human body have been acknowledged since early History, then neglected, and finally rediscovered by very precise devices. Finally, I explain the relationship between these forces and the Oriental systems of energetic channels and centers. Any electric current flowing through a conductor produces a magnetic field around it. This phenomenon is represented by the Ampère’s Law, and it’s most basic representation is shown on the image below, where an electric current is shown as a straight line, showing the corresponding magnetic field that goes around it. If an object has polarity – even when lacking any electric conduction- this means that the number of electrons is different in each pole, they have therefore a different electric potential, which is measured in Volts. Polarity is seen in practically everything. The water molecule has polarity. The Earth has polarity. The living cells have polarity, therefore, the human body as a whole has polarity. Fluids by themselves are not very good electric conductors. 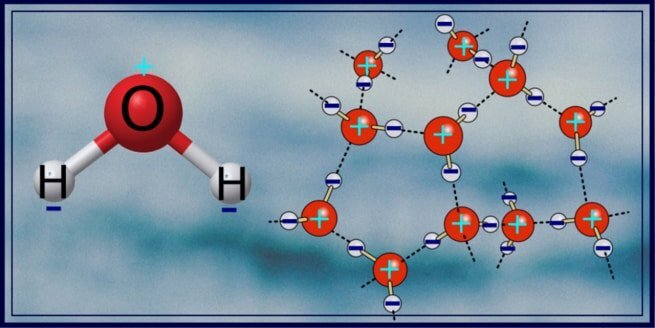 But the presence of salt and diverse ions turns the tables, and this is why water is a very good electric conductor. We must remember we are 70% made of water. The following image shows why the water molecule has polarity, as the oxygen has a negative charge and the hydrogens have a positive charge. This opposites attract when several water molecules are together, as shown at the right part of the image. Direct Current (DC): developed commercially by Edison, where the electric charge flows only in one direction. Any battery appliance uses a DC current. Alternate Current (AC): discovered by the great, awesome and amazing genius Nicola Tesla, where the charge shifts direction periodically, this is the one on every home and business. DC current is the type of electricity that happens in living beings, neurons communicate and send signals with this type of electric flux. But AC is much more efficient for businesses and factories. A material that can transport the electric charge is called a conductor, this happens because it has electrons available. An insulator lacks electrons to share, so the electric charge can’t go through there (resistance). In between these two, exist the semiconductors, which are materials whose resistance is high but still lower than insulators, so it can carry electric charge under the adequate conditions, and most importantly: it’s conductance can be modulated by temperature. Semiconductors are the basic components of all modern electronics, and hungarian Nobel laureate Albert Szent-Györgi was a pioneer in studying semiconduction in living beings. Animal electricity was discovered by Luigi Galvani in around 1780, by applying electric discharges to the leg of a dead frog. The leg moved every time a discharge was given, establishing a direct connection between animal tissue and electricity. Galvani strongly believed that “animal electricity exists in a state of ‘disequilibrium’, and he determined that there was a “particular machine capable of generating such disequilibrium”. Nowadays we know that this machine is the cell membrane. The cell membrane has a set of proteins that serve as ionic pumps, which in a state of ‘rest’ maintain selected ions inside or outside the cell. Compared to the outside environment of the cell, the interior of the cell has a negative charge, and this is how an electric potential is created. This electric charge difference between the inside and the outside ranges from -40 to -80 millivolts and the most typical value is -70 mV. In order to communicates and send signales and information, neurons quickly reverse the charges from each side of the membrane, which is known as Depolarization, and this means that positive charges are pumped into the cell. Afterwards, the membrane pumps back those particles and restores the negative charge inside the cell, which is known as Repolarization. The following GIF image shows how the sodium molecules get into the inside of the cell during depolarization, and how the potassium and sodium move to restore the negative charge inside the cell. Neurons transfer electric information that travel through the axon, a process known as Action Potential. When the depolarization reaches the end of the neuron, hormones are released. Thus, electricity from neurons eventually releases hormones such as dopamine, serotonine and oxitocin, among many many others. This is why our body is embedded into electrochemical language. An interesting scientist is Robert O. Becker. His work proves that living organisms show a direct current of electric charge, which is measurable from their body surface. Even more interesting, whenever a wound occurs, there is a current leak that creates a short circuit in this DC current, so the wound healing current goes by semiconduction. He also pointed out the fact that the perineural system is sensitive to magnetic fields. Centuries ago, Egyptians and Greeks used magnets as healing devices. As a matter of fact, they were common tools among healers along History, but the last centuries have imposed mechanistic views of the human body which neglect biofields. Even Egyptians worked on their Qi and their chakras as well. The German physician Franz Anton Mesmer seems to be another outcast of mainstream science. According to his only disciple, he understood health as the free flow of the process of life through thousands of channels in our bodies. Illness was caused by obstacles to this flow, and this matches the Oriental systems description of chakras, meridians, and Qi energy, also known as Chi or Prana. Mesmer started by using magnets in order to restore that flow, but later on, he realized that the use of his bare hands could make the same effect. Despite all his accomplishments, he never got recognition from the scientific community. Even King Louis XVI sent a commission of experts, which included Antoine Lavoisier and Benjamin Franklin among others, with the conclusion that such flow doesn’t exist and all was a product of imagination (despite Franklin and colleagues, the specifics of such experiments had many flaws). So the magnetic realm of the human body was forgotten for a long time. One century after Mesmer’s death (1815), the electric realm of the human body started being measured. The first important breakthrough was made when Einthoven invented the first Electrocardiogram in 1903, this device records the electric activity of the heart. Because of this, he was rewarded with the Nobel Prize in 1924. 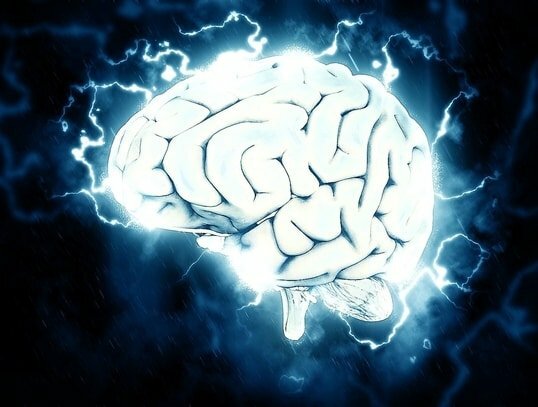 Since then, electric records of the heart dynamics have been widely accepted, and other parts of the body were added afterward, like the brain. In the same year in which Einthoven received his Nobel Prize, Hans Berger recorded the first Electroencephalogram in his son’s scalp. And in 1939, Burge detected voltage changes in the body. He detected that physical activity makes the body become more negative. Sleep has shown to produce a voltage decline. And anesthesia has a turn over the positive. The heart is by far the greatest electric generator of all the body; the continuous pumping and motion also create a magnetic field around itself which goes way beyond the skin. It creates electrical, sound, pressure, heat, light, magnetic and electromagnetic signals. Because the blood is a very good conductor of electricity, the whole of the circulatory system pulses with electricity each time the heart beats. Every organ of the body has its own field, even every cell. The Institute of Heart Math is making great developments into the integration of the electric and magnetic fields of the heart and its relationship with the well being. The electromagnetic field of the brain is about a thousandth as strong as that of the heart. But the existence of very sensitive devices allows to record the magnetic field created by the electricity inside the brain, this measurement is called magnetoencephalography, and its actual main use is on the titanic Human Connectome Project. Magnetoencephalography and electroencephalography are complementary tests that provide information about brain activity. Also, there is a hormone called neuromelanin, whose paramagnetic properties have been arising in the past years. I have already written a couple of articles about it, click here to read them. Additionally, there are very sensitive magnetometers known as SQUIDS, that have been used in order to detect the magnetic emissions from the human body. I wrote about this at the Reiki Frequencies post. 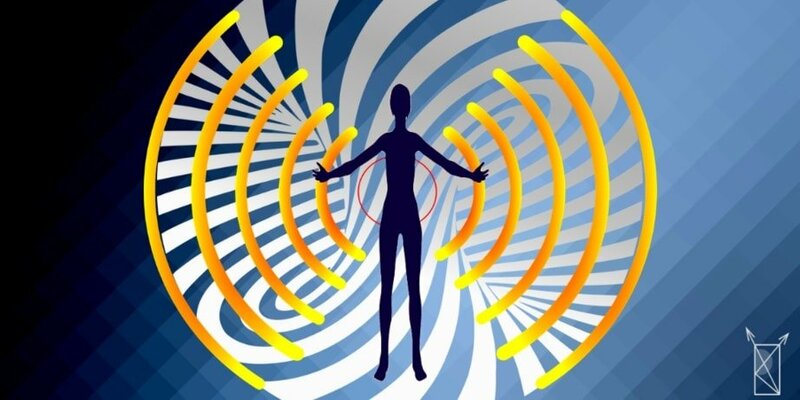 The main point of this article is that the overall electromagnetic field is a composite of all the fields that are created by the organs and muscles. Mainstream science can’t ignore anymore this fact. 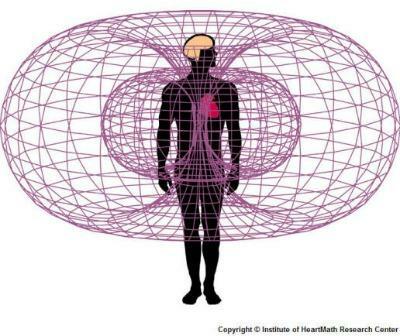 The body emanates an electromagnetic field, also known as biofield. If the body’s circuitry is electric, then it must create a magnetic field around it. That being said, we can think of the auric field and the biofield as the same thing. Several scientists and healers agree on that aspect, but there is still a lack of consensus. Another option, which I personally think is more accurate, is that the biofield and the auric field are different sheaths of the energetic body, maybe even overlapping at the same levels, but on a different frequency or dimension.